Mindfulness is the practice of being present, noticing the positive and negative elements that impact us on a daily basis and not becoming overwhelmed or reactionary towards them. As a clinical-research physiotherapist, Dr. Karayannis’s goal is to address the complex nature of chronic spinal pain by looking at each individual’s unique presentation, selecting the most appropriate rehabilitation approach, and promoting a growth mindset. Evidence indicates that physical and psychological therapies are the most effective treatments, but there are many forms to choose from. The current challenges lie in not only predicting who will best respond to one approach over another, but in understanding the processes that explain how or why specific therapies work. Dr. Karayannis, welcome to the podcast. Thanks, Joe. It’s good to be here. Nick, I’ve been wanting to chat with you for a long time because I think your resume, your credentials, everything is really so interesting and fascinating. A good place for us to start is take us through your trajectory as a clinician, researcher and mindfulness teacher and how you really came to weave all three of those things together. As you develop expertise in a certain area, you start to see the more complex patients or they get sent your way. I got into to physical therapy because I myself had experienced athletic injuries and received PT care and thought it was a nice path of wise livelihood where I can help to improve and relieve suffering in people’s lives. After PT school, I was very keen on getting into biomechanics a little bit more and to manual therapy. I went on to go into a manual therapy fellowship program where I was doing my clinical work in the Northwest in Oregon and received some great training there in terms of biomechanical aspects of pain. As you develop expertise in a certain area, you start to see the more complex patients or they get sent your way. I was appreciating that I had a lot of different questions about what approach to use and why certain patients seem to be responding to one approach over another. Also just getting a sense of where my gaps were in terms of appreciating psychological aspects of pain and being able to help patients along that path. When the opportunity to pursue a PhD came about, which I pursued in Australia under the mentorship of Paul Hodges and Gwendolen Jull and specifically focusing on back pain. In particular what was interesting to me which was this idea of subgrouping. The idea of can we define treatment effectiveness if we can better identify who’s going to respond to one type of approach over another. This was more in the movement-based paradigm. I studied that and realized that there were significant gaps that using just one approach in isolation isn’t necessarily comprehensive or doesn’t necessarily fully address the behavioral aspects of pain. After I finished my PhD, I wanted to get a little bit into more of the mindfulness-based aspects and really integrate my own personal interest and experience with meditation practice into my science. There was an opportunity to come at Stanford. They were investigating mindfulness-based stress reduction and needed someone with a little bit more of a physical performance, physiotherapy lens to help with some of the measures and assessments. That’s what I came for. I also had the opportunity to work in an interdisciplinary pain management center where I still work here at Stanford and just to learn from the clinical psychologist, the pain psychologist, to work with them, to do treatments with them, and just learn also on the clinical realm of how to be a little bit more comprehensive with my treatment approach and then started to get into more of the mindfulness-based stress reduction training and had been teaching that for a while now. There were a couple of physios or PTs in my clinic who practiced it and I just noticed their demeanor. There’s a strong alliance and connection with their patients. I thought, “There’s something there.” I started to read a little bit more on insight meditation and practice it and go to some meditation retreats. I always thought it was more of a personal thing and not necessarily be bridging it into my practice until really I saw the door has opened. I think more of the acceptance of mindfulness in the more mainstream medicine started to occur in the last five to ten years or so where I thought, “I can study this.” There have been enough scientific studies out there to legitimize my interest in weaving it into my practice and my research. I suppose the interest was seeing it, practicing it embodied in the therapist whom I admired. Also experiencing it for myself just the benefits of having greater awareness. I could see that helping with my connection with my patients, with developing stronger compassion and empathy towards them, having less judgment about their particular maybe behavioral choices they might have. It’s just been incredibly opening for me in terms of my practice and my research. That’s where I’m at now, is really trying to understand it from a mechanistic, from a process standpoint, how can we improve it, how can we study it and measure it, and get a sense of what it is, what are the active ingredients of mindfulness. I’m a firm believer that it’s not only mindfulness of the sitting meditation but incorporating that with meditative movement practices like Tai Chi and yoga, those types of things. When we combine the physical and the behavioral therapies together, I think that’s the sweet spot for me. I agree, the combination of the two is really where the power starts to happen. I want to get back to some of the aspects you mentioned within the mindfulness. Before we do, what are some of the discoveries and nuggets that you found within your research as far as the movement aspect of treating chronic pain? In your case specifically, I know you treat a lot of spinal pain and do clinical research on spinal pain. What kind of movement practices have you studied and what are some of your assumptions and summaries of them? There really are quite a number of them both Eastern and Western. No one studied all of them but I know you study a significant portion of them. I see the same things in terms of there’s probably a lot more overlap and things that unite them than things that separate them. I think that’s also the same in the PT world with what are different movement-based approaches. In more of the meditative movement approaches, most of my training has been with yoga and various styles of yoga. The teacher training program I participated in did introduce different styles and elements. I would say the ones that I most gravitate towards are more of the slow flow Vinyasa-based types of practice. I think they’re more accessible to people with persistent pain that maybe have had some longstanding avoidance of movement or some worries or fears about movement being potential harmful or injure them. I think that’s a nice gateway. I think also I have more recently been interested in Tai Chi and Qigong. Particularly, I’ve just finished a six-day retreat where I was introduced to a form of Qigong, which has been fun to learn. It’s great. I’m mostly using Tai Chi from Dr. Peter Wayne’s school of training and also Dr. Paul Lam’s Tai Chi, which I think is a little bit more accessible in terms of breaking down into small components for students. I blend them and I also even blend traditional therapeutic exercise into the movement sequence. In terms of research and what I’m discovering here is I’m interested in the idea of interoception, body awareness. If people do practice this more meditative routine types of therapies, how that can positively improve their sense of body relaxing in an immeasurable way. What you’re saying is that when people have chronic pain, that their interoception can be affected or compromised and it’s something that we should be aware of, we should really assess for, and then figure out what’s the best way to treat it. Not to lump everyone in one box here but in general, common patterns emerge and I think oftentimes we can use discrimination, the sense of touch, the sense of how to connect to the body, how to move in a smooth and effortless way. I think some of these practices can be helpful in tapping into that and restoring them in order to control that motor awareness so to speak. I just want to use the word disassociation, which is common in trauma literature where people disassociate from their body or their experience. Is interoception or problems with interoception similar to that? Possibly, I don’t know if that particular population say traumatic or PTSD or dissociative, there’s been a link to measuring that in terms of the interoception. It seems like an intuitive thing that there would some association there but I couldn’t speak deeply to the literature on that. It seems to make a lot of intuitive sense that they will be connected. There’s a little bit of overlap in some of the yoga research that using yoga and yoga classes for people who have had trauma. A lot of the ways, a lot of the things that we do to calm their nervous system, to make them feel safer, autonomic regulation, things of that matter. It’s interesting how some of those kinds of therapies start to overlap with other conditions. Oftentimes people with PTSD have chronic pain as a symptom or vice versa. You can have chronic pain, you start feeling traumatized because your life changes so dramatically and so drastically. 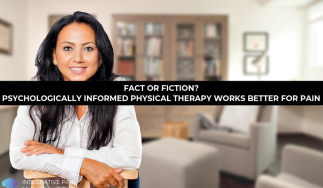 You’re a physiotherapist so you’re working with patients. What’s the one thing that you wish patients knew when they came to you that right now they don’t and you spend a little bit of time educating, working with them on the topic? Reflect a little bit on what their understanding is of their pain and their sense of confidence of how accurate that knowledge is. I think everyone is different. Oftentimes what can be helpful at least to reflect on if you’re going in for a PT consult is to reflect a little bit on what their understanding is of their pain and their sense of confidence of how accurate that knowledge is. I think oftentimes they can be based on what other providers have told them, which may be accurate or inaccurate or what their families and friends have told them. I think to get a sense of what their sense of is in terms of their beliefs about their pain. I think it’s also very helpful for them to reflect a little bit on where they’re at in terms of their goals, their values. What are some activities that they are presently avoiding that they like to return to. Also to get a sense of what are those potential barriers and potential solutions to achieving those goals. I think those are fundamental questions to reflect on before you come in for a visit. Their understanding where they’re at, where they want to go in terms of their movement practice if they have one or what they like it look like are probably the two big things. Also just having them reflect a little bit about what are they sensing in their body not only in terms of the relationship with pain movement but what are they sensing in terms of what they perceive to be maybe some impairments in their flexibility or strength or whatnot. Bringing all those things up to the table and also getting a sense of their expectations not only in terms of what we can do as treating providers but also what their interest in exploring in terms of self-care, whether that’s physical or behavioral therapies or meditation. The important thing is just to meet that person with where they’re at and that can be completely variable. Since you have so many tools when you have this discussion with them, are you providing them with options and saying, “We could work on more movement-based practices. We can work on more mindfulness.” Or do you give them the option that, “We can work on the two together,” and see where they fall and what they grasp on to? Part of it is really using motivational interviewing, just to get a sense of what they’re interested in exploring and getting a sense of where they want to focus on. The two can complement each other at the same time. I don’t think necessarily you need to choose one or the other. Meditation can be a nice pathway into introducing more movement and vice versa. I don’t necessarily have any pre-judgments of where it’s going to go. Ideally, I like to introduce all of these different tools or just really get a sense of where the gaps are, where are they currently, what if they probably are maybe exploring or that could be helpful for them. If a physical therapist or any other practitioners listening to this and they’re saying, “This is interesting that this guy is integrating mindfulness into his treatment approach.” What advice would you give them on how mindfulness could impact their profession, their practice, their daily care of patients? My sense is that if you embody mindfulness, if you practice meditation on a regular basis, that you’re more present with your patient. That sense of therapeutic alliance, that sense of connectedness, that sense of empathy really is very present if you are interested in cultivating mindfulness and it really complements. It helps to develop that sense of rapport with patients. To make it more of a collaborative effort, many patients can feel judged and I think mindfulness is a nice way to really hold that quality of nonjudgmental awareness. We’re often a little bit self-critical ourselves. No one likes to be judged by other providers. Just holding that space is where I think mindfulness and compassion training can really be helpful for the clinician and also to prevent burnout. 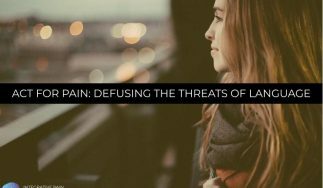 It can oftentimes be a case for many clinicians working with persistent pain patients. I think learning to work that suffering that’s present in the room and being present and allowing and noticing your own emotional triggers. All those things can be very helpful. The burnout part is really interesting to me. When I think of so many clinicians who go into this type of work where they’re helping people with pain, ultimately when they start out, they’re extremely energetic and they want to fix everyone on their schedule. That’s very noble and that should be the goal so to speak. Then there’s another part I think as you rest in your career, you realize that probably the most powerful tool that you have is education. You start to shift a little bit toward, “I’m going to fix everyone,” to “I’m going to be present with them, provide them with as much knowledge that I have and within the confines of what they want.” Do you see mindfulness in practice as a way to almost start to reframe how you see yourself and what your role is as a clinician in helping people with pain? I do very much see that role as more of a teacher or mentor, coach rather than a healer. I’m more interested in empowering the patient to heal themselves and to realize that potential is there and to instill some sense of optimism and encouragement. As physios, that’s what we do, we have to potentially do and I think moving it can be incredibly building towards that confidence and empowerment. That’s what I get excited about. When I see that change and their reflection with their perception of their body and themselves, that’s very gratifying for me. Ultimately, seeing them accept those behavior changes and once they start those behavior changes, that’s when the magic happens. It may happen for someone within three weeks or it may happen within three months or for some people maybe a little bit longer. Ultimately, once they grasp onto those changes, that’s really where the magic happens. Empathy is an interesting word that I don’t think any physical therapist has really come across in school. Maybe they’ve started to come across it if they have a yoga practice or mindfulness practice or maybe principles of Buddhism. Can you explain what empathy is and why it’s important not just for physios but for practitioners across the board? Empathy is a component of compassion. I’ll speak a little bit towards the broader aspect of compassion and what that components entail. I think oftentimes there’s a lack of clarity on what empathy and people talk about what they call compassion fatigue or empathy fatigue with some misnomers there. The basic aspect of compassion, if you will, and it being a component of that is it has an affective dimensions or quality to it. You see your sense that someone else is suffering. Then the second aspect as part of compassion is that motivational dimension, that motivation to want to relieve that suffering. That’s compassion and there’s really no compassion fatigue. You can sometimes have empathy fatigue, which is just again more of sensing of feeling but those are the components. In terms of cultivating compassion, a big part of compassion training and cultivation is mindfulness by a period of self-awareness, nonjudgmental presence, and openness to present moment in a nonjudgmental way. Also, there’s that loving kindness attitude, that self-compassion not only towards yourself but for others. The third is that sense of what they would call a common humanity. Just like me that person experiences suffering. Those three things that comprise that umbrella, that larger form of compassion and empathy is just one aspect of that larger framework. I love the humanity part. If anyone knows any kind of Italian or Latin, the root of the word, compassion, actually means ‘we suffer together.’ When you break those words apart, you put them together, it means we suffer together. I don’t think the patient necessarily wants to see you suffer but I think it does start to talk around the topic of a therapeutic alliance or a therapeutic bond. When someone realizes that there is that compassion that’s flowing almost bi-directionally, that it’s easier for them to say, “I’m going to see this person twice a week for eight weeks.” It makes it easier for them to make changes in their life and to trust you as their provider. With great mindfulness, awareness, alleviation of that suffering from there is that path to alleviation through the practice of cultivation of mindfulness. That knowledge of suffering or awareness of that suffering is present, that’s a very central Buddhist tenet. One of the noble truths is that suffering or dissatisfaction, however you want to label it, is inevitable in our lives. With great mindfulness, awareness, alleviation of that suffering from there is that path to alleviation through the practice of cultivation of mindfulness. Nick, I’m curious to know at this intersection of movement and mindfulness, what’s your weekly mindfulness and movement practice? If you have a typical week, how do you fit it in and what does that look like? I have about a 30 or 45-minute sit in the morning. Usually, I like to start out with some very light yoga or Tai Chi sequence to settle the mind. I have my meditation in the morning and then go and get ready for work. I try to be mindful with my daily activities, whether that’s commuting to work or whatnot. If it’s on a week that I meet with my community of meditators with sangha, so to speak, that will involve again another 45-minute sit followed by usually a dharmata, different aspects of Buddhist practice with meditation and cultivating mindfulness. If it’s a non-weekly group sits, then it would probably with my running or my swimming or my rowing. Those are some ways I’ll also integrate just meditation and motion so to speak. It’s pretty much a daily 30, 45-minute practice. Oftentimes, just trying every hour just to be more aware of my breath. When I’m leaving my classes, I have the benefit of receiving meditative movement there. That’s my weekly practices. An individual practice involves sitting as well as yoga. I love to walk on a weekend to go for long walks and I like to spend some time doing silent walking. That’s how I get into my daily life. You can receive benefits if it’s even one minute or five minutes or ten minutes a day. It’s important just to acknowledge that it may not be approachable for everyone to be able to practice to that point. It can be difficult to maintain to practice, to build or start it again. The mantra of start and continue is a good one to follow and to not be too judgmental towards yourself if you can’t keep that 30 minutes to 45 minutes. You asked about studies. There have been some studies that show even fifteen minutes have shown some positive responses in terms of the brain changes. Even just fundamentally practice-wise, I can say just a minute of mindfulness is better than none. As we move toward this concept of psychologically informed physical therapy, taking into account they were not psychologist but were starting to really incorporate principles of psychology, when we teach people mindfulness, how does it start to affect their thoughts around their pain experience? It unfolds differently for each person. 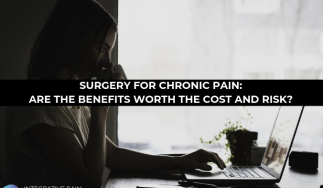 For the most part, some of the responses I’ve had in the discussion groups I’ve led with MBSR program, I sense that the relationship with their pain is what changes. That sense of acknowledgement, acceptance is a critical aspect towards a lot of people recovering and moving forward in a more positive direction. That sense of nonjudgmental awareness and being less self-critical that can really be a positive thing that unfolds with mindfulness practice. Re-engaging with your body, that can be a probable part of the experience. Probably many different ways, it unfolds different for everyone. I would say the big ones are probably nonjudgmental awareness, that can be of help with their emotion regulation, help with their communication with other people. As you move on in your research career, what is something that you’re interested or excited about going a little bit deeper on that you haven’t explored just yet? I’m really interested in exploring some of those mediators or processes that have changed that we can go and practice, people that participate in mindfulness or meditative movement practices. For me, I’m interested in terms of interoception or body awareness, how can we get a sense of that, and for certain people respond more than others with the pain acceptance. How does it actually roll if we can measure that a little bit more effectively? Also self-efficacy, building confidence to start doing things. Those are big, strong mediators that we know tend to be helpful in terms of moving towards people on a more positive path. I’m interested in studying those and getting a sense of what are the active ingredients of these different forms of therapy so we can better target, better refine, and maybe better identify who might be more appropriate for one approach over another. That’s a lifetime of work but hopefully we can get there. This self-efficacy part I think is so important. It is a lifetime of work. Maybe we’ll say you’re halfway into them. Nick, it’s been great talking to you today on the podcast, talking about the intersection of mindfulness and movement and how they come together both in clinical practice as well as research. If people want to learn more about you as far as your clinical practice and learn about your research, how can they find more information that about you? I suppose the best medium would be either via LinkedIn or my Twitter account @DrNickVK. ResearchGate, I keep up to date in terms of my research projects. The labs site and clinic site, either of those is okay. 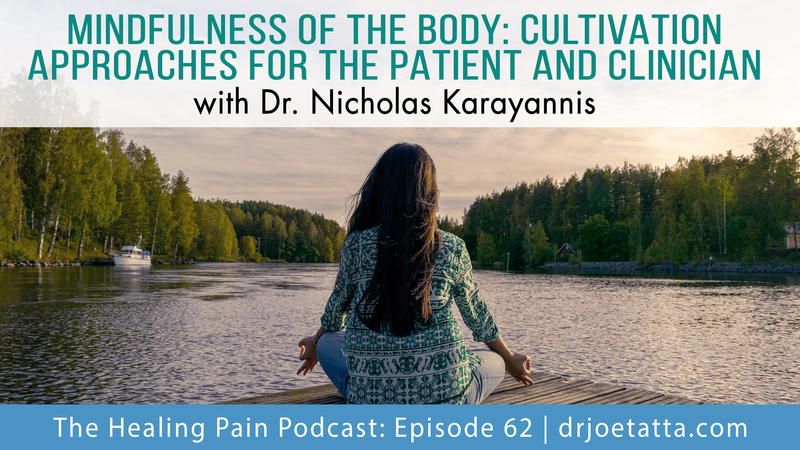 I want to thank Dr. Nicholas Karayannis for being on The Healing Pain Podcast. He is a Physiotherapist, a Clinical Researcher and a Mindfulness Teacher. You can reach out to him on Twitter @DrNickVK. Let Nick know how much you enjoyed this podcast today. Share it out with your friends and family. Hop into iTunes and give us a five-star review because that will help us spread the message of how we can help people heal from pain and have less suffering. Until next week, I’m Dr. Joe Tatta. We’ll see you on The Healing Pain Podcast. As a clinical-research physiotherapist, Dr. Karayannis’s goal is to address the complex nature of chronic spinal pain by looking at each individual’s unique presentation, selecting the most appropriate rehabilitation approach, and promoting a growth mindset. Evidence indicates that physical and psychological therapies are the most effective treatments, but there are many forms to choose from. The current challenges lie in not only predicting who will best respond to one approach over another, but in understanding the processes that explain how or why specific therapies work. Nicholas’s research helps address this challenge by focusing on understanding how pain affects posture and movement and developing novel treatment decision-making approaches in order to refine rehabilitation programs.